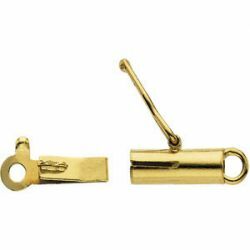 Description: 18k yellow gold round barrel clasp for rope and round link chains. The connector rings are closed and one jump ring will be needed for attachment. The tongue end of clasp will need a jump ring, the barrel end has an attached closed ring that could be cut open or a 2nd jump ring can be used if needed. Outside diameter is 8.5x4.0mm with an inside diameter of 1.7mm on the connector rings.